The outlook over the next two weeks is starting to show some light at the end of the tunnel. 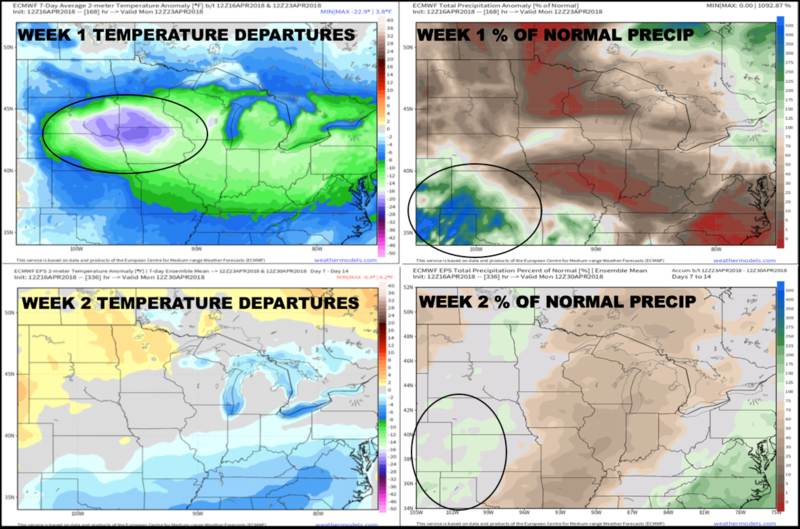 Forecast for week one keeps temps well below normal, especially across the heart of the ag belt, and we cannot rule out some more snow over the next 2-4 days across the central plains. As we look ahead into week two it starts cold but has the potential to moderate significantly especially across the central US and Midwest. (It is important to note that the cold risks are still not completely off the table just yet as we rumble into May). Not only will it warm up but it also looks to turn drier than normal too with the exception of the southern plains in the wheat regions. Some much-needed rainfall is in the forecast not only this week but possibly next week as well. Some places this week in the southwestern plains will see 2-300% of the normal precipitation which will be HUGE for the folks dealing with this historically severe drought and wild fires. Relief is on the way. More details daily on Bamwx.com.